I’m not a stickler for interior decorating trends. I believe people should live with what they love … whatever makes them smile when they walk in the front door. When chevron was hot, I never added it to my decor. And the only ombre thing I’ve ever had in my house was the frosting on a Wintermint Cake. But one interior design trend trend I think I’m going to love this year is the renewed pastel color trend started by Pantone. Serenity and Rose Quartz were named Pantone’s 2016 color of the year. 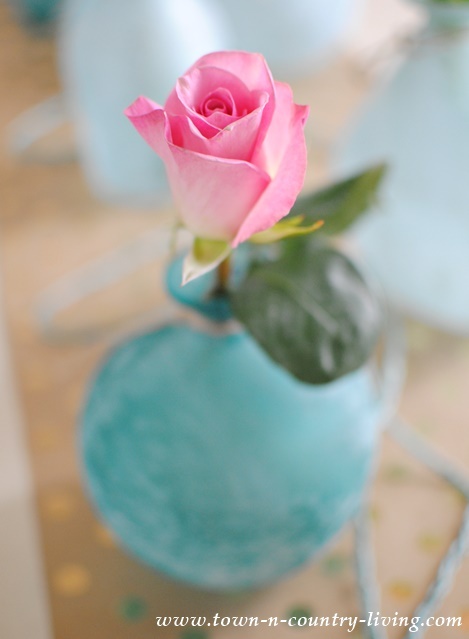 Serenity is a calming shade of blue that soothes the soul and Rose Quartz is a perfect complement. Combine the two and you have a lovely shade of lavender. 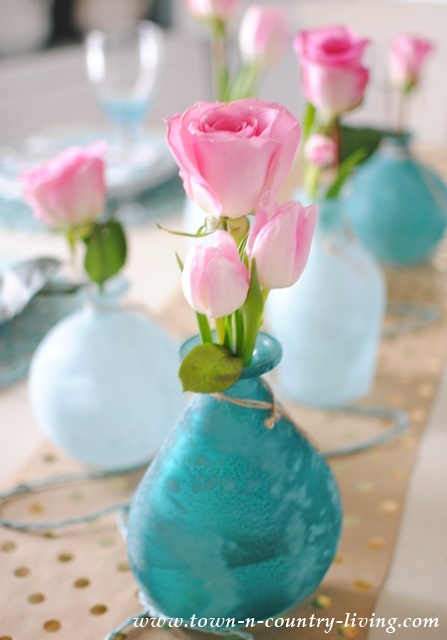 I found some beautiful blue glass vases at a very economical price and knew they’d look charming with pink roses and tulips tucked inside. 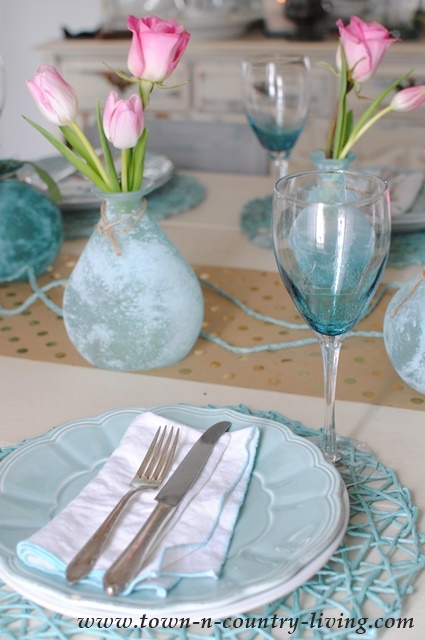 Although they’re more of an aqua than Serenity, this is my personal interpretation of the 2016 color trend as seen here in my dining room. 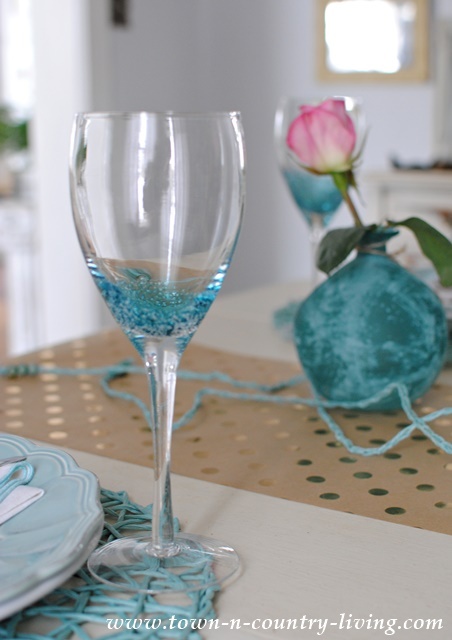 At the same time I found the vases, I found these pretty glass goblets with blue bubbles. As luck would have it, the placemats were waiting for me too. I found all the items at TJ Maxx. 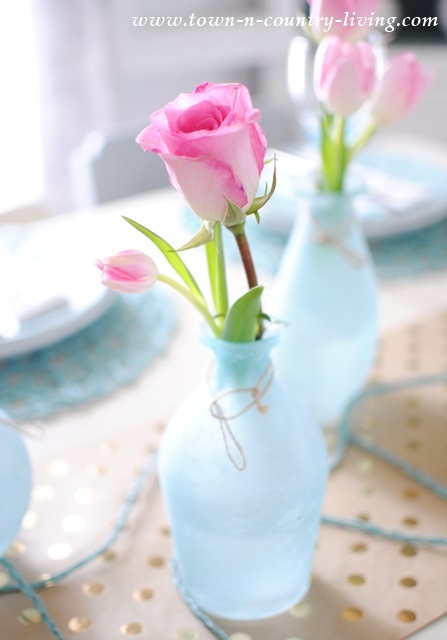 I’ve always loved every shade of blue imaginable, and pink is one of my favorite accent colors to use with it. 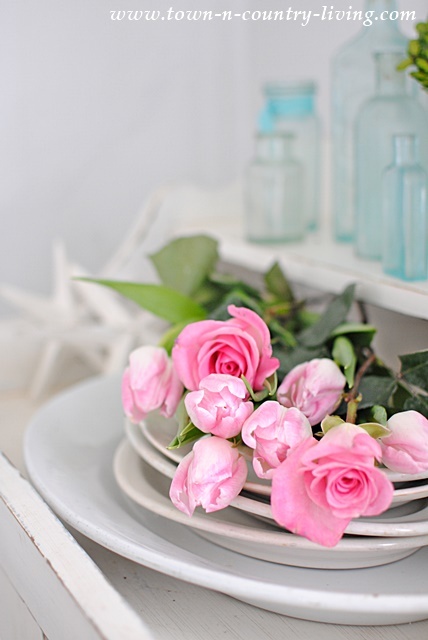 Will you humor me as I show photos of pretty pink flowers in my dining room? Flowers are my favorite subject to photograph because they’re so photogenic. I added a few rose and tulip stems to my dry sink in the corner of my dining room. So delicate and beautiful! 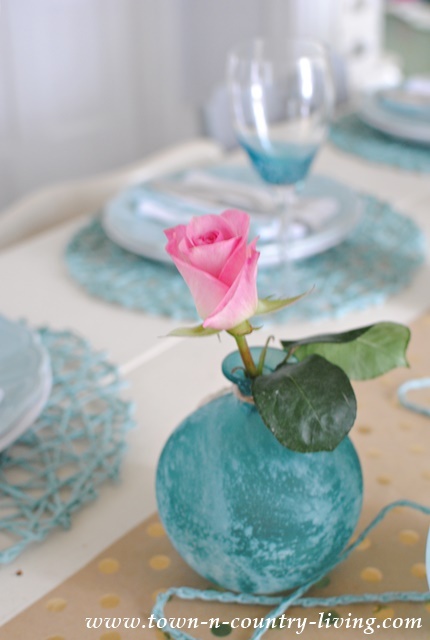 I hope my pink and blue color trend photos have lifted your spirits on this January winter day. I’m happy that pink and blue are back in high style. This is one trend that excites me! You can read more about 5 interior design trends for 2016 that I wrote about last week. What a lovely table seting. The colors are a treat for the eyes plus you just bought some beautiful items that you can use year round. I don’t go with trends either, most of them don’t fit my home’s style anyway. I always love your pop of pink added to the decor, Lovely! Love the colors even though the pink does not do well in my home,other than my granddaughter’s room. 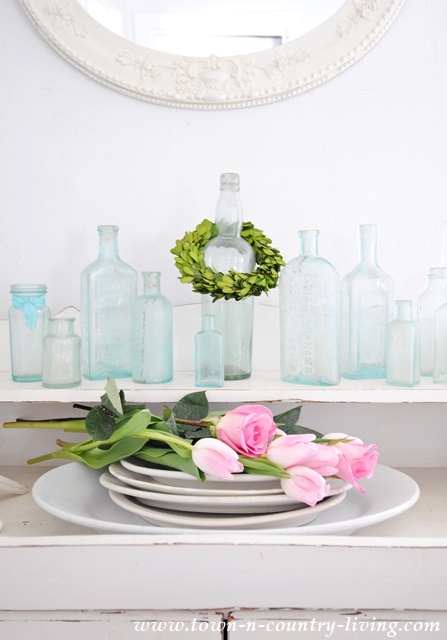 I started collecting the beautiful blue vintage bottles….Love yours!!! Beautiful colors….pop with the pink color added. 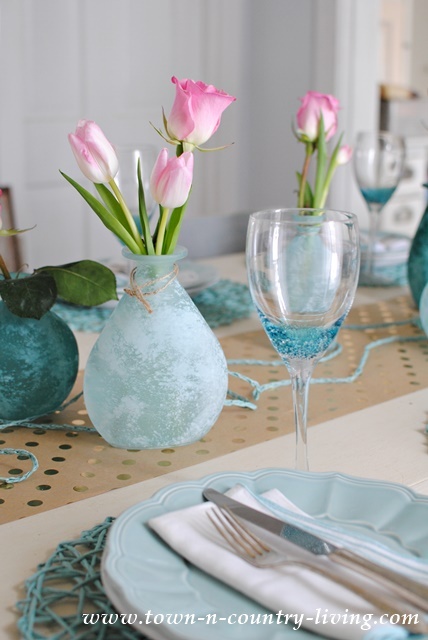 I just love the table with the blues and pink. I too love pastels. The glasses on your table are spectacular. I remember my first apartment. 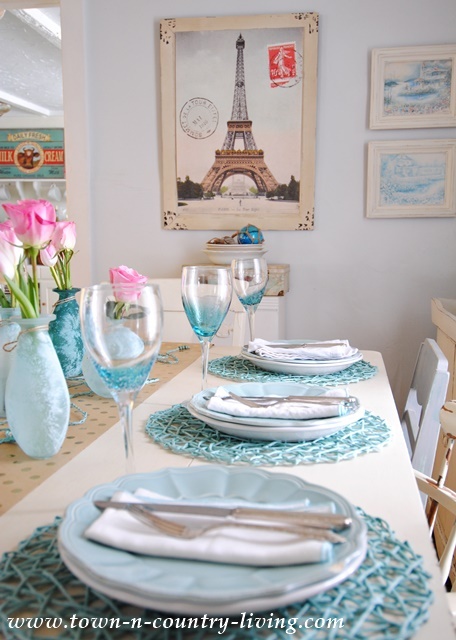 I had pale green on my living room walls and blue and white with a dash of pink in my kitchen. Every time I think of that apartment I have fond memories. The colours for this year are wonderful. I have gone back to all the pastel colours I love in our new home and I am so glad that I did. It only has to please us. Every morning I get up I can love them all over again.